It’s easy for your diet get sidetracked around the holidays, as there are numerous temptations around every corner. From Thanksgiving to Christmas to the abundance of holiday parties, it’s hard to stay dedicated to the cause when someone’s trying to shove pumpkin pie or sugar cookies in your mouth. That’s why you see so many people making New Years Resolutions to lose weight. But if you’re working out without the proper supplements, you’re just spinning your wheels. Today I want to talk about protein shakes, as these are essential to your fitness success. Now, there’s plenty of information out there about the importance of protein after workouts, but here’s what it comes down to: You need to consume protein after a workout to maximize muscle growth. You’re doing this because resistance exercises break down muscles, which then requires a fresh infusion of amino acids to repair and build them. There are different schools of thought when it comes to how much protein you should be consuming after a workout, but a study in the American Journal of Clinical Nutrition said 20 grams is ideal in order to maximize muscle growth. For years I’ve relied on powdered protein shakes both pre and post-workout, but I recently had the chance to try out some of the Core Power Protein Shakes. Now normally I wouldn’t even consider a liquid protein shake, as most of them are full of sugar and stuff that outweighs the benefits. But when I heard that Core Power is the Official Protein Drink of the Sochi 2014 Winter Olympic Games, I figured it must be the real deal. If it’s good enough for our Olympians, then it’s good enough for me! 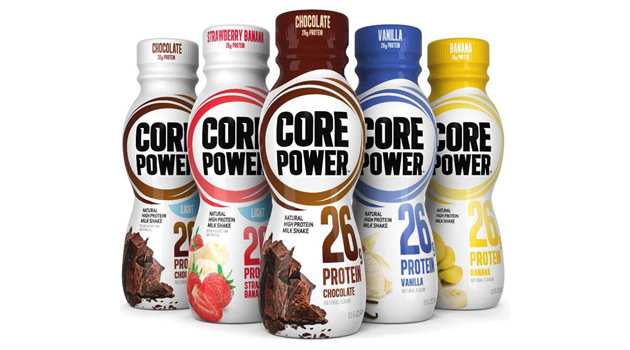 Core Power’s protein shakes deliver natural whey and casein proteins from real milk – never removed from their original liquid state. The result is a “better” milk with more protein, more calcium, more vitamins – and no lactose or chalky taste. The regular variety delivers 26g of protein, and comes in Vanilla, Chocolate, and Banana flavors. The light variety delivers 20g of protein, and comes in Chocolate and Strawberry Banana. I’ve tried all 5 flavors, and they’re all delicious. Core Power protein shakes are the real deal, and I highly encourage you to incorporate it into your workout routine moving forward. Use their store locator to find the Core Power retail location nearest you, or order it online from Amazon.com if you prefer.